What do you get when you make Christopher Marlowe a master spy in the employ of the English government during the reign of Elizabeth I? What happens if you give him a side kick by the name of Will Shakespeare? You get a delightful romp through the whole of English society in 1593. 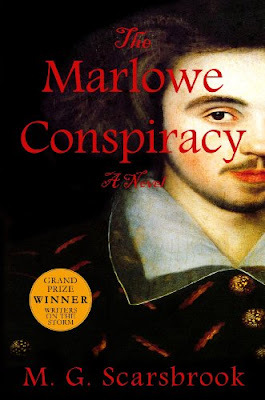 Along the way, Marlowe manages to be accursed of atheism, a crime punishable by hanging, he makes love to one of Elizabeth’s ladies-in-waiting in the queen’s bed, spends several nights in dungeons, sparks a prison riot, passes counterfeit money, and pens his poem, ‘Hero and Leander’ while dodging assassins. This is not a book for the Elizabethan purist. While it is obvious that Scarsbrook spent a great deal of time researching Marlowe and his times, the tale is fanciful. The gossamer webs of the storyteller connect Marlowe to plots among Lords of the Realm to gain influence with the queen and to become spymaster of all of England. That being said, the book does a very good job of cleaving to the few facts known of Marlowe’s life. Since this novel is not history, it can be fun. Shakespeare can take on the role of Watson to Marlowe’s Sherlock Holmes. Queen Elizabeth can come off as being a bit like the Red Queen in ‘Through the Looking Glass’ and Marlowe’s love interest can be a married lady of high standing and noble blood. The archbishop can decide the only way to save people is to kill them, and Marlowe’s patron and spy handler can decide to have him killed because Marlowe is having an affair with his wife. This is a very busy book. There is a great deal to like about this book. Both Marlowe and Shakespeare are fully realized, very likeable characters. Both are complex men for a complex age. Marlowe is clever, arrogant, and the smartest man in the room most of the time. Shakespeare is subtle, witty, and loyal. Together they take on the whole of England to save Marlowe from the gallows. He does an excellent job of painting a dynamic society on the verge of spinning beyond the control of the ruling class. The archbishop worries about atheists, Puritans, and plays. The nobles worry about the riots and the never ending war with France, and everyone worries about the plague. The action is fast, and only slightly incredible. You will find no deep introspection. This Marlowe is a man of action. This book does not fit easily into any one genre. The historical purist would break out in a rash while reading this book. It isn’t exactly a spy novel. Scarsbrook’s subtle literary allusions would be roof jokes for the casual reader. In the end, I would have to guess that it is written for the intellectual adventure market if such a thing exists. I suppose it does. Therefore I recommend it to people who know the works and the lives of Shakespeare, and Marlowe, and are willing to look at them as literary characters rather than as authors. I would also recommend it to anyone who loves a good adventure story and is willing to suspend belief for the sake of the story. There is one final question that has to be answered. What would Marlowe and Shakespeare have thought of the book? I think they would have liked it, Shakespeare would have refused to take a back seat to Marlowe, and I think they would have enjoyed adding a few touches of their own.